I love this recipe for pumpkin cheesecake. It’s pretty, it’s rich, and it’s always a crowd pleaser. However, I never, ever fix it for Thanksgiving dinner. Why? It’s too rich, that’s why. With all the other goodies I serve at the Thanksgiving Feast (turkey, dressing, my famous make-ahead gravy, mashed potatoes, sweet potato casserole with the candied pecans around the top, cranberry/strawberry salad, peas, balsamic roasted vegetables, rolls and butter, pecan pie), I would rather have the traditional pumpkin pie with a dollop of whipped cream. Any other time of the year, I’m game for whipping up the pumpkin cheesecake. I’m a sucker for cheesecakes, anyway. Key lime cheesecakes are probably my favorite, especially the two layer one I often fix in the summer because it’s so doggone refreshing! 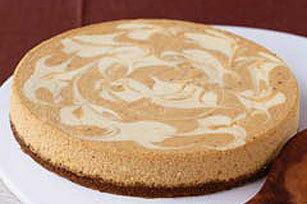 The pumpkin swirl cheesecake has my vote as one of the best autumn or winter desserts to serve for a crowd. The servings can be on the small side because they are so rich and it’s easy to get at least 12-15 servings from a large springform pan. It’s a make-ahead dish, so it’s perfect for a busy person to prepare a day or two in advance. Go for it. By the way, this is a recipe from Philadelphia (AKA Kraft) Cream Cheese. Oven 325, 300 for a dark pan. 1. Mix ginger snap crumbs, pecans and butter; press firmly onto bottom and 1″ up sides of 9″ springform pan. 2. Beat cream cheese with mixer, adding 3/4 c. sugar and vanilla. Add eggs, one at a time, mixing on low speed after each addition, until well blended. 3. Remove 1 1/2 c. plain batter; place in small bowl. 4. Stir remaining 1/4 c. sugar, pumpkin and spices into remaining batter; spoon half of the pumpkin batter into crust; top with spoonfuls of half of the reserved plain batter. Repeat layers. Cut through batters with knife several times for swirl effect. 6. Cool completely on rack. Run a knife around the sides but do not remove the sides until the cheesecake has cooled. Then remove the sides and refrigerate 4 hours or overnight before serving. Store leftovers covered with plastic wrap in the refrigerator for a few days. The current (September, 2007) issus of Food & Wine magazine features Italian cuisine. I have dog-eared more pages than I will be able to fix in the next year, but I will give it a try. I had guests for lunch today and, although we only had carry-in sandwiches for lunch, I wanted to fix something new for dessert. I remembered seeing a rather simple “mousse” recipe in Food & Wine and I decided, two hours before my guests were to arrive, to see if I had the necessary ingredients. I did, with one exception – creme fraiche. My small local grocery doesn’t carry such things, and I didn’t have time to drive to a larger store. I remembered reading somewhere, sometime that one could make a reasonable substitute for creme fraiche. Google came to the rescue, as it often does. A quick substitute is 1 part sour cream and 1 part heavy cream, both of which I had. Problem solved. It took about 5 minutes to put the mousse together and it was in the frig for nearly two hours. It was a big hit. In fact, my two guests copied the recipe at the table in order to be able to make it at home. 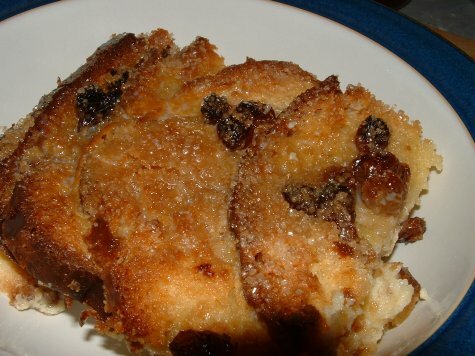 It is one of those rich, satisfying desserts that belies its simplicity. So, here is your gift for the day, compliments of Food & Wine. Be warned, however. The recipe makes a pitifully small amount, supposedly for four servings. We had three servings. I suppose four would have been possible and would have made a sufficient dessert after a large meal. We only had sandwiches, so it seemed rather scimpy. I would double the recipe to make adequate servings for 6. I served small cookies for the crunch factor that is missing in mousses. In a medium bowl, using an electric mixer, beat the chocolate-hazelnut paste with the creme fraiche and brandy at low speed until smooth. In another bowl (smaller) beat the heavy cream until firm peaks form (about one minute). Using a rubber spatula, fold the whipped cream into the chocolate-hazelnut mixture until no streaks remain. Spoon the mousse into small bowls and refrigerate for 20 minutes. Serve with cookies if desired.